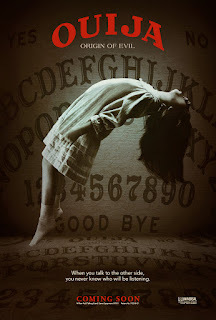 Home / FILM POSTERS / HORROR FILMS / Creepy Levitation in New Poster of "Ouija: Origin of Evil"
Creepy Levitation in New Poster of "Ouija: Origin of Evil"
“Ouija: Origin of Evil” stars Henry Thomas, Elizabeth Reaser, Doug Jones, Parker Mack, Sam Anderson, Kate Siegel, Annalise Basso and Lulu Wilson. The film is produced by Platinum Dunes partners Michael Bay, Brad Fuller and Andrew Form (“The Purge” series, “Teenage Mutant Ninja Turtles” series), Blumhouse Productions’ Jason Blum (“Insidious” series), alongside Hasbro’s Brian Goldner (“Transformers” and “G.I. Joe” series) and Stephen Davis (“Ouija”). Mike Flanagan directs from a screenplay he wrote with his “Oculus” and “Before I Wake” collaborator, Jeff Howard. “Ouija: Origin of Evil” is distributed by United International Pictures through Columbia Pictures.